This art was created using Photoshop Elements 13. Mum used the sketch filter in plaster and then played around with some adjustments to lighten, balance, etc, to achieve this effect. There are loads of new products at our store CatGoddessDesigns. Check them out today! TROUBLE WITH THE ABOVE LINK? Athena! Your Mommy always captures yous so purrfectly! Another lovely photo of you, Athena. We apologize for adding a generic link. Our post will be publishing in a couple of hours but Jan will be asleep then and won't be home until dinnertime tomorrow. See you then. I love your art today! That's a very nice creation ! I just love this framed sketch of lovely sleepy Athena.! 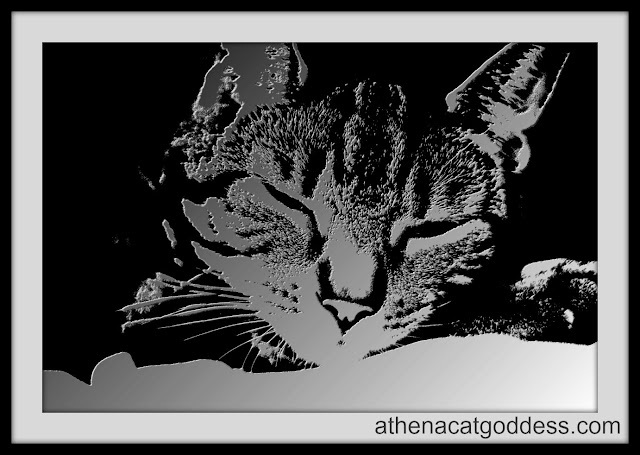 Athena you are our supreme Goddess of Art! That’s a very cool filter. I’ll have to remember it. Good luck with your store. Thank you all for joining our hop today. We hope you have a lovely Caturday! Fanks fur hostin' Caturday awrt. Yous lookin' bootyful. Have a gweat day. You look just precious there, Athena!